I'm putting together a book on Iodine which needs some personal success stories from those who have benefitted from iodine. All stories will be anonymous but will state your approximate age, condition, etc. I know people have reported their blood Sugar normalized, and things we thought were unrelated, like Psoriasis, resolved. Some of the oldtimers on Curezone will vouch for my integrity to this mission. I want to really mainstream this message and am determined. But I need your help. If you have posted your history on this board, please let me know where it is and I'll do the leg work. All those used in the book get a free copy, of course! Ok, I wish to hear from the old timers. Does anyone know this woman? I don't, not personally, but she runs the breastcancerchoices.org site that has the Iodine protocol page that is referred to ALL the time here. She knows Janie Bowethorp (StopTheThyroidMadness.com) site and Stephanie Buist (Iodine yahoo group and NaturalThyroidChoices.com) site. She has helped spread the word about iodine. Lynne and what she does is great - do a search for THIS forum and breastcancerchoices.org. Go ahead and e-mail her, Nick...it's a worthy cause and we promote her and her organization all the time. Absolutely, I second what Iolite and BootstrapPuller said. Lynne and her nonprofit organization have been laboring for years to spread the word about iodine and its value and how to incorporate it into a health maintenance and/or disease-fighting plan. They have figured things out, and we on this forum have figured things out, and we've learned from each other and been mutually supportive all along. i have done my best to ensure that all of the good personal testimonies have "R" ratings, many with "RRR" and most with at least two Rs. that would be a good place to start. I would be interested in sharing my story. Would a work in progress be of interest? I am not out of the woods yet, but I was able to get off of hydrocortisone last year after one year on iodine. I was on it for 8 years and the two times I tried to get off i got sick. thanks so much for your website!!!!! I would love to hear your whole story. Please email me or PM me. Getting off HC is a huge deal. Eight years is a wowie. Meet Jesse, our Red Eared Slider. We got him out of pity in 2000 when he was 15 years old; his owner was sick and tired of him and ready to release him into the wild. We figured he’d be dead (a little defenseless aparment turtle, with all those predators out there ) in a couple of days, so we took him in. That makes him 22. 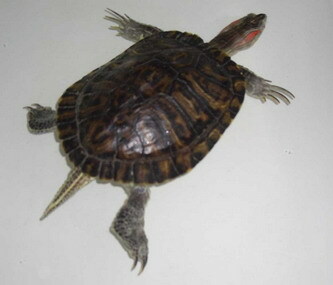 Red Eared Sliders live approx. 15 years in the wild, up to 30 in captivity. So 22 means he is pretty “mature”, and I don’t mean to sound inconsiderate, but it shows. He used to love my son’s closet, but for about 1 year now has chosen a new favourite location: the space around the toilet (*sigh* I know, bizzare, but “de gustibus non discutandum”). 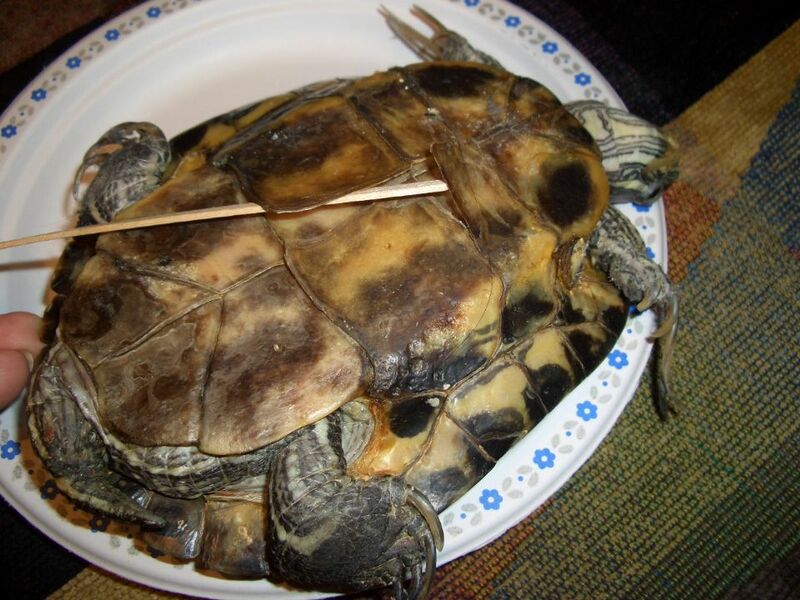 Red Eared Sliders hibernate in winter, but are quite active during the rest of the year. Well, Jesse spent the last 3 ½ years of his life sleeping most of the time. I had to force him to eat, and he would only do so with great difficulty and no enthusiasm whatsoever. We were worried, and since he is a member of the family, we took him to the vet (he slept his little head off all the way there and slept through most of the examination). The result was not good: “he’s old, sooooo – expect the worst. His system is shutting down”. My son and I were not happy at all – we love him. Since the bathroom is the place he resides now, I must clean it VERY often, and I mean disinfect-type-of-clean. One day, a while after I started taking Iodine, I decided to use some to disinfect the bathroom floor. I usually clean everything with Vodka, to the sheer desperation and outrage of my Russian friends. I made a solution of castille soap, water, and I added a hefty dose of Iodine, proportionate to the amount of water used. I tossed Jesse out of his residence, and started cleaning. A couple of minutes later he came running, yes, running, stopped smack in the middle of the bathroom and extended his head fully, touching the wet floor, sniffing, sniffing, sniffing! I was watching him, totally fascinated. I’ve never seen him do anything like that before. His little body language was screaming: I LOVE this stuff!!!! *He SHEDDED his entire skin and was the ugliest little thing you’ve ever seen while that happened. It took him about 6-8 weeks to shed the old skin. He looks amazing now, much younger then when we got him 7 ½ yrs ago, I kid you not! *He is very energetic, roams the entire place, comes running to meet us when he hears the door, watches TV with us, begs to be put on the coach. (He must have been a dog in a previous life). *He eats a lot now, has a voracious apetite. I should take a video and put it in YouTube, he’s hilarious, you wouldn’t expect that sort of eagerness to get food from a turtle! *He seems to have discovered a new zest for life, follows us like a puppy around the house, and begs for TLC. We give in and play with him: my son and I lie on the floor and toss a paper ball between us, while Jesse is chasing it! It’s so funny! He’s still on 2 drops and loving it. He’s getting more active and younger all the time. About 2 months ago I woke up one Sat morning with “my head in a bag”. Since Jesse eats once a week on Saturdays nowadays, he was ready to go, but I was very sleepy. Still on auto-pilot, got his feeding pail out, filled it with water, got the Lugol’s and attempted to put the usual 2 drops in his water. The dropper was on its last leg, something went wrong, and I figure 5-7 drops got into the water. I was not in the mood to redo the whole thing, so I thought I’d put him in and watch for any sign of displeasure. I put him in and to my surprise, he fully stretched his body and instantly seemed to have reached “turtle Heaven”. I looked and looked at him, waiting for him to “come out of it” – he did not. After about 20 minutes, the fish had thawed, I cut it and placed it in the pail. Normally he’d be frantic by now, trying to get his food. This time, he looked as ecstatic as when he first got into the water, completely ignoring me and the FOOD. It took him another 10 min to become aware of the food (smell, perhaps) and start eating. I thought that was remarkable. I was going to post the story then, but stuff happened and I just hadn’t found the time to do it. This was the start of the “6-drops-era”. In the meantime, every Saturday since, we had a carbon copy of the above story, with him in the same amount of water as during the “2-drops-era”, only on 6 drops now. The result(s)? Nothing, on the surface. For a while, I hadn’t noticed anything unusual e.g. an increase in his energy levels, appetite, stamina, etc. – but I kept him on the 6 drops, since he seemed to enjoy it so much. 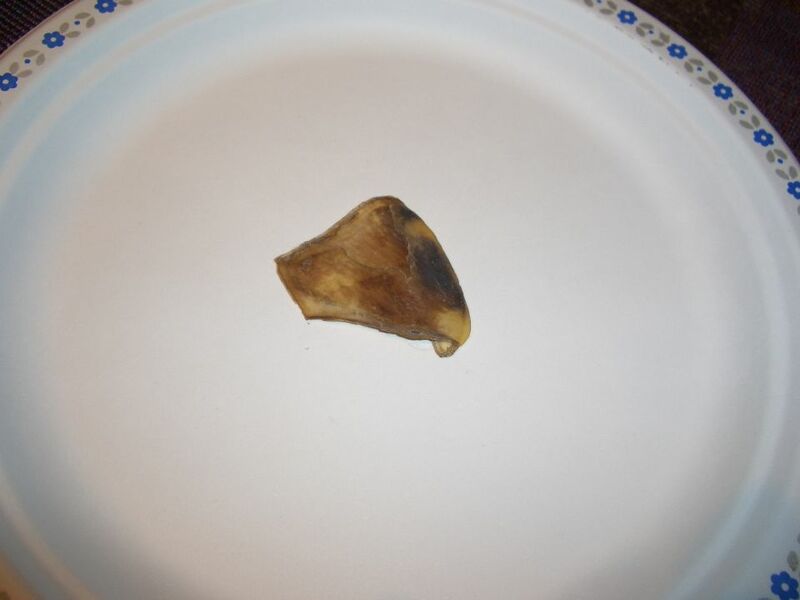 However, a couple of weeks ago, I found a rather large piece of shell somewhere on the floor. I put it in some “safe place” with the intent to take a picture and post the story. Of course, I completely forgot where I put it (I need to up MY dose, too! ); I’m sure I’ll eventually find it when I’ll look for something else. Last week I found a second piece – I’ll post a picture of this one. This Saturday, after taking him out of the pail, I washed him as usual, and when I flipped him over, I noticed there are 4 large pieces missing from the shell underneath his body. The new “scales” where the shedding happened are “younger”, smoother (of course, they are new), pinkier (like all new tissue), and they look fresher. The scales above these 4 new ones are loose and appear to be shedding soon. I find this very exciting. We’ve had him since 2000 and we never saw anything like this happen before. I believe the upper shell is next in the shedding process; it is comprised of smaller, sturdier, denser scales and I think they will need more iodine/time for the shedding to occur here. I find all this very exciting. 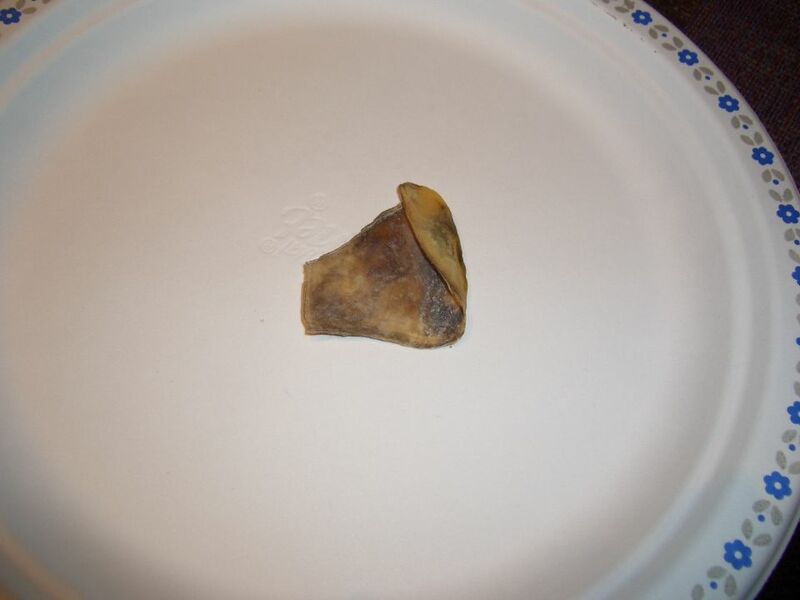 This is tissue much stronger/harder/hardier than our nails, and yet, I could see REGENERATION and RENEWAL in a relatively short time (about 6 weeks) at a dose 3 times higher than his usual dose (2 drops/week), the one he was on since I started him on iodine, probably close to Apr/May 2007. Obviously, he is a TURTLE so I’m not suggesting in any form or shape we do the same, I’m just observing and sharing my observations with you. Please do not think I’m using him as a “lab rat” – he is my “turtly” son and I love him dearly. DEARLY. I hope you all know that. I just took the pictures I’m going to use for this post. You should have seen him: he was so calm, so patient, he just waited for me to finish and did not fight me at all! (He knows). and there is much more, some heartbreak and some triumph. freya, if youre lurking, maybe you could contact CS about the whole ordeal. i have yet to find any creature which did not lust after Iodine and thrive once getting it. its good for man and beast. Interesting. 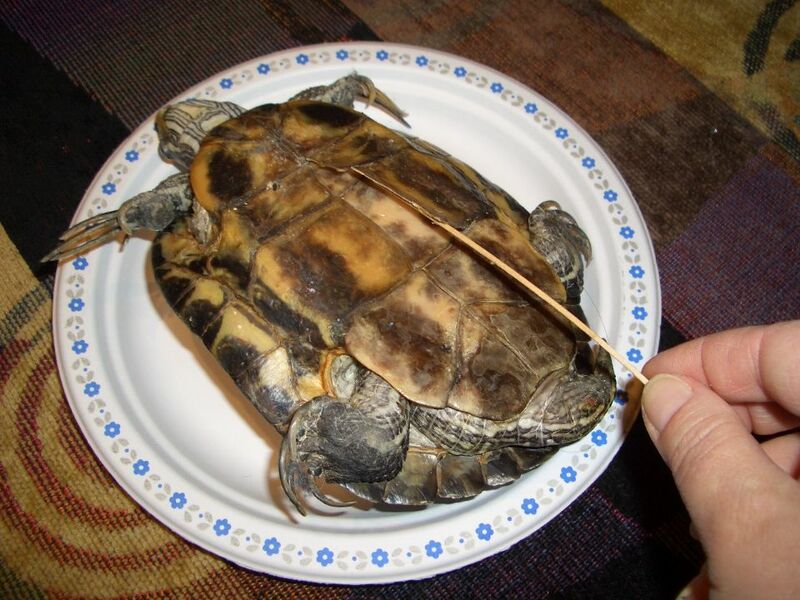 Evidently, the turtle stretches its limbs to enable its body to absorb more Iodine from the water its placed in, which Iodine is in turn necessary for the turtles' shell shedding-mechanism to transpire, among other things. Yikes, I have Jesse's story in my file but not all the pictures. This is amazing. I'll try to contact Freya. Trapper, I'm making my way through your Rs, RRs and RRRs. Thank you for all you contributions. I always mention you guys when I make a presentation as being an instrumental part of making Iodine into a grass roots health movement. I'll contact you privately. You all have created a huge historic document here. I hope somebody is saving it on a file.